Today as the world marks the International Day for Biological Diversity, a report launched by WWF in collaboration with the Convention on Migratory Species, reveals the steep challenges scientists and policy makers are grappling with as they struggle to reduce bycatch in fishing gear the world over, to guarantee the survival of cetaceans and other endangered marine life. It further highlights the need to step up public pressure for enhanced management measures by the fishing industry to protect cetaceans for generations to come. Dolphins, whales and porpoises (cetaceans) are fascinating animals that continue to capture the imagination of humans as evidenced by the increasing number of whale watchers taking to the seas in search of a glimpse of these majestic creatures. They are amongst the most intelligent animals on our planet and play a critical role in maintaining marine ecosystem health and therefore human health. Yet, a dolphin, porpoise or whale is accidentally killed in fishing operations somewhere in the world about every two minutes. 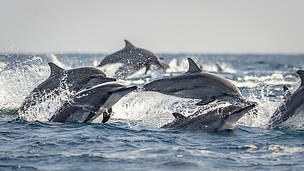 Cetaceans have a strong influence on their associated ecosystems and their removal in large numbers is likely to have catastrophic knock-on effects on the ecosystems in which they occur. As large predators, cetaceans are ecologically significant since they store and move nutrients (carbon and nitrogen especially) and energy within and between ecosystems. Each year, over 300,000 cetaceans are entangled and drown in harmful fishing gear such as gillnets. In Peru alone, 15,000 to 20,000 dolphins and porpoises die every year as a result of being trapped in fishing gear. According to the report, the most promising solutions are fisheries-based and include the development of alternative gear to replace current fishing methods such as gillnets and the establishment of effectively managed marine protected areas and time-area closures. However, the case studies presented in this report highlight only a few examples where successful mitigation strategies have been effectively implemented. This challenge is further compounded by the dearth of data globally on fisheries, cetacean populations and their depletion rates as well as the overall impact of fishing on individual populations. On the positive side, countries like the US are now taking a strong stand to bring an end to cetacean bycatch. New US regulations under the Marine Mammal Protection Act (MMPA) require any country exporting fish to the US to have marine mammal protections equivalent to those in the US— particularly measures against bycatch. Because the US is one of the world’s largest seafood import markets, the new rule could positively influence fishing standards in major exporting countries including Canada, Chile, China, Japan, and Mexico (see “Investigations into Cetacean Bycatch Reduction Measures of Countries Exporting Seafood to the US”). With clear and present dangers growing for cetaceans worldwide, government and industry leaders must abandon unsustainable fishing practices, in favour of bold, effective action and scaling solutions that reduce bycatch. This will determine how each future International Day for Biological Diversity, and every other day, can change from being a steady march of the decline of dolphins, porpoises and whales, to a genuine marker of progress. Collaborating with fishers, gear specialists, technical experts, funding bodies, and managers to foster the development, implementation and scaling of alternative sustainable gears and practices that reduces impacts on threatened species such as cetaceans.. Sharing lessons learnt and available information on mitigation measures with authorities and regional governance bodies to develop guidelines to reduce bycatch of endangered species through alternative fishing gear or changes in fishing practices.